Cristiano Ronaldo – My fav player! – Shoot Sampei Bisak Net Tiang Gol Ya! Cristiano Ronaldo – My fav player! Not to be confused with Ronaldo. “CR7” redirects here. For other uses, see CR7 (disambiguation). This name uses Portuguese naming customs. The first or maternal family name is dos Santos and the second or paternal family name is Aveiro. * Senior club appearances and goals counted for the domestic league only and correct as of 17:03, 26 February 2012 (UTC). Cristiano Ronaldo dos Santos Aveiro, OIH, (born 5 February 1985), commonly known as Cristiano Ronaldo, is a Portuguese footballer who plays as a winger or striker for Spanish La Liga club Real Madrid and is the captain of the Portuguese national team. Ronaldo became the most expensive player in football history after moving from Manchester United to Real Madrid in a transfer deal worth £80 million (€94 million). In addition, his contract with Real Madrid, in which he is paid €12 million per year, makes him one of the highest-paid football players in the world, and his buyout clause is valued at €1000 million (€1 billion, in English usage), as per his contract. Ronaldo began his career as a youth player for Clube de Futebol Andorinha de Santo António, where he played for two years, before moving to Clube Desportivo Nacional. In 1997, he made a move to Portuguese giants Sporting Clube de Portugal. Ronaldo’s precocious talent caught the attention of Manchester United manager Alex Ferguson, who signed the 18-year-old for £12.24 million (€15 million) in 2003. The following season, Ronaldo won his first club honour, the FA Cup and played at Euro 2004 with Portugal. Ronaldo scored his first international goal in the opening game of the tournament against Greece and also helped Portugal reach the final. He was featured in the UEFA Euro All-Star Team of this competition. Ronaldo was the first player to win all four main PFA and FWA awards, doing so in 2007. He was third in the 2007 FIFA World Player of the Year award and second in the 2007 Ballon d’Or award. In 2008, Ronaldo won the Champions League with United, was named best forward and player of the tournament and was the competition’s top goalscorer as well as winning the European Golden Shoe, becoming the first winger to do so, and topping the Premier League Golden Boot award. He won three of the four main PFA and FWA trophies, only missing the PFA Young Player of the Year, and was named the FIFPro, World Soccer, Onze d’Or, and the FIFA World Player of the Year, in addition to becoming Manchester United’s first Ballon d’Or winner in 40 years. Ronaldo holds the distinction of being the first player to win the FIFA Puskás Award, in 2009, an honour handed by FIFA to the best goal of the year. He scored that goal from 40 yards out against F.C. Porto in a UEFA Champions League quarter-final match, while playing for Manchester United. Three-time Ballon d’Or winner Johan Cruyff said in an interview on 2 April 2008, “Ronaldo is better than George Best and Denis Law, who were two brilliant and great players in the history of United.” He was second in the 2009 FIFA World Player of the Year award and also second in the 2009 Ballon d’Or award. Ronaldo became the highest goalscorer in a season in the history of Real Madrid with 53 goals, surpassing the club’s previous high of 49 by Ferenc Puskás. Six days later, Ronaldo broke the record of most goals ever scored in a season in La Liga with 40, surpassing Telmo Zarra‘s mark established in 1951 (38 goals) and Hugo Sánchez‘s mark established in 1990 (38 goals). Ronaldo also broke Zarra‘s record of most goals per minute, with a goal scored every 70.7 minutes. The newspaper Marca, the official deliverer of the Pichichi Trophy (the top La Liga goalscorer award), claimed that Ronaldo scored 41 goals (Marca assigned one more goal to Ronaldo than La Liga, which attributed it to Pepe). By doing so, he won the European Golden Shoe award once again, becoming the first player to win the trophy in two different championships. He was third in the 2010-11 UEFA Best Player in Europe Award, behind Lionel Messi and Xavi, and second in the 2011 FIFA Ballon d’Or, behind Messi and ahead of Xavi. He is described as a skillful winger who will take on any defender with his dribbling and pace; and who possesses a powerful, accurate free-kick and crossing ability. Ronaldo is able to score with his head and feet but also has been criticized for going to ground too easily. Ronaldo was born in Santo António, a neighbourhood of Funchal, Madeira, the youngest child of Maria Dolores dos Santos Aveiro, a cook, and José Dinis Aveiro, a municipal gardener. His second given name “Ronaldo” was chosen after then-U.S. president Ronald Reagan, who was his father’s favourite actor. He has one older brother, Hugo, and two older sisters, Elma and Liliana Cátia. His great-grandmother Isabel da Piedade was from Cape Verde. Ronaldo joined Sporting’s other youth players who trained at the Academia Sporting, the club’s football academy, in Alcochete. He became the only player ever to play for Sporting’s under-16, under-17, under-18, B-team, and the first team, all within one season. He scored two goals in his league debut on 7 October 2002, which Sporting CP won 3–0 against Moreirense, while featuring for Portugal in the 2002 European Under-17 Championship. At the age of 15 Ronaldo was diagnosed with a racing heart, a condition that might have forced him to give up playing football. The Sporting staff were made aware of the condition and Ronaldo’s mother gave her authorisation for him to go into hospital. While there, he had an operation in which a laser was used to cauterise the area of his heart that was causing the problem. The surgery took place in the morning and Ronaldo was discharged from hospital by the end of the afternoon; he resumed training only a few days later. In November 2002, Ronaldo was invited to Arsenal‘s training ground, London Colney to meet manager Arsène Wenger and his coaching staff. Wenger, who was interested in signing the midfielder had arranged to meet Ronaldo’s representatives, Formation (who suggested the player originally to Gérard Houllier, then Liverpool’s manager) in the subsequent months to discuss a transfer arrangement. However he came to the attention of Manchester United manager Alex Ferguson in the summer of 2003, when Sporting defeated United 3–1 in the inauguration of the Estádio José Alvalade in Lisbon. Ronaldo’s performance impressed the Manchester United players, who urged Ferguson to sign him. Ronaldo made his team debut as a 60th-minute substitute in a 4–0 home victory over Bolton Wanderers. He scored his first goal for Manchester United with a free kick in a 3–0 win over Portsmouth on 1 November 2003. Ronaldo ended his first season in English football by scoring the opening goal in United’s 3–0 FA Cup final victory over Millwall. He scored United’s 1000th Premier League goal on 29 October 2005 in a 4–1 loss to Middlesbrough. He scored ten goals in all competitions, and fans voted him to his first FIFPro Special Young Player of the Year award in 2005. He was sent off in the Manchester derby at the City of Manchester Stadium on 14 January 2006 (a game which United lost 3–1) for kicking City’s former United player Andrew Cole. Ronaldo won his second trophy in English football in the 2005–06 season, scoring the third goal in Manchester United’s 4–0 Football League Cup final victory over Wigan Athletic. Ronaldo amassed a host of personal awards for the season. He won the PFA Players’ Player of the Year and PFA Young Player of the Year awards, joining Andy Gray (in 1977) as the only players to receive this honour. In April, he completed the treble by winning the PFA Fans’ Player of the Year. Ronaldo was also one of eight Manchester United players named in the 2006–07 PFA Premier League Team of the Year. Ronaldo’s 2007–08 season began with a red card for a headbutt on Portsmouth player Richard Hughes during United’s second match of the season, for which he was punished with a three-match ban. Ronaldo said he had “learned a lot” from the experience and would not let players “provoke” him in the future. After scoring the only goal in a Champions League away match against Sporting, Ronaldo also scored the injury-time winner in the return fixture as Manchester United topped their Champions League group. He finished as the runner-up to Kaká for the 2007 Ballon d’Or, and was third in the running for the FIFA World Player of the Year award, behind Kaká and Lionel Messi. On 19 March 2008, Ronaldo captained United for the first time in his career in a home win over Bolton, scoring both goals in the 2–0 victory. The second of the goals was his 33rd of the campaign, which set a new club single-season scoring record by a midfielder and thus topped George Best’s forty-year-old total of 32 goals in the 1967–68 season. Ronaldo scored another brace in a 4–0 win over Aston Villa on 29 March, which at the time gave him 35 goals in 37 domestic and European matches as both a starter and substitute. Ronaldo’s scoring streak was rewarded with his becoming the first winger to win the 2007–08 European Golden Shoe, finishing eight points ahead of Mallorca‘s Dani Güiza. 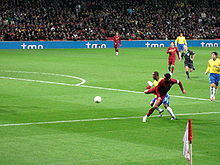 In the 2007–08 Champions League final on 21 May against league rivals Chelsea, Ronaldo scored the opening goal after 26 minutes, which was negated by a Chelsea equaliser in the 45th minute as the match ended 1–1 after extra time. His misfire in the penalty shoot-out put Chelsea in position to win the trophy, but John Terry shot wide right after slipping on the pitch surface, and Manchester United emerged victorious 6–5 on penalties. Ronaldo was named the UEFA Fans’ Man of the Match, and wrapped up the campaign with a career-high 42 goals in all competitions, falling four short of Denis Law‘s team-record mark of 46 in the 1963–64 season. On 5 June 2008, Sky Sports reported that Ronaldo had expressed an interest in moving to Real Madrid if they offered him the same amount of money the team had allegedly promised him earlier in the year. Manchester United filed a tampering complaint with FIFA on 9 June over Madrid’s alleged pursuit of Ronaldo, but FIFA declined to take any action. Speculation that a transfer would happen continued until 6 August, when Ronaldo confirmed that he would stay at United for at least another year. Ronaldo underwent ankle surgery at the Academic Medical Center in Amsterdam on 7 July. He returned to action on 17 September in United’s UEFA Champions League goalless group-stage draw with Villarreal as a substitute for Park Ji-Sung, and scored his first overall goal of the season in a 3–1 League Cup third round win over Middlesbrough on 24 September. 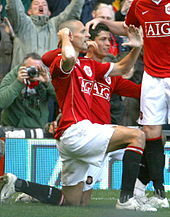 In a 5–0 win over Stoke City on 15 November 2008, Ronaldo scored his 100th and 101st goals in all competitions for Manchester United, both from free kicks. The goals also meant that Ronaldo had now scored against each of the other 19 teams in the Premier League at the time. On 2 December, Ronaldo became Manchester United’s first Ballon d’Or recipient since George Best in 1968. He finished with 446 points, 165 ahead of runner-up Lionel Messi. He was awarded the Silver Ball after finishing with two goals as United won the Club World Cup on 19 December. Ronaldo scored his first Champions League goal of the season, and first since the final against Chelsea, in a 2–0 victory over Internazionale that sent United into the quarter-finals. In the second leg against Porto, Ronaldo scored a 40-yard game-winning goal as United advanced to the semi-finals. He later called it the best goal he had ever scored. Ronaldo participated in his second consecutive Champions League final, but made little impact in United’s 2–0 loss to Barcelona. He finished with 53 appearances in all competitions, which was four higher than the previous year, but scored sixteen fewer goals (26) than his career-best total of 42 from the previous season. On 11 June, Manchester United accepted an unconditional offer of £80 million from Real Madrid for Ronaldo after it was revealed that he again had expressed his desire to leave the club. It was confirmed by a representative of the Glazer family that the sale was fully condoned by Ferguson. On 26 June 2009, Real Madrid confirmed that Ronaldo would join the club on 1 July 2009 from Manchester United for £80 million, after agreeing terms and signing a six-year contract. Ronaldo’s contract is worth €11 million per year and it has a €1 billion buy-out clause. He was presented to the world media as a Real Madrid player on 6 July, where he was handed the number 9 jersey. The shirt was presented to him by Madrid legend Alfredo Di Stéfano. Ronaldo was welcomed by 80,000 fans at his presentation at the Santiago Bernabéu Stadium, surpassing Diego Maradona‘s record of 75,000 fans when he was presented in Italy, after he was transferred from Barcelona to Napoli in 1984. Ronaldo made his Madrid debut on 21 July in a 1–0 win over Shamrock Rovers. His first goal came one week later with a penalty in Madrid’s 4–2 win over LDU Quito. On 29 August, Ronaldo capped his La Liga debut with a goal, scoring Real’s second from the penalty spot in a 3–2 home win against Deportivo La Coruña. On 15 September, Ronaldo scored two free-kicks in a 5–2 away victory over Zürich, his first Champions League goals for Real. He broke a Madrid club record when he scored in a league match against Villarreal and thus became the first ever player to score in his first four La Liga appearances. An ankle injury suffered on 10 October, while Ronaldo was on international duty with Portugal against Hungary, kept him out until 25 November, which in turn caused him to miss both of Madrid’s Champions League group stage matches against Milan. Ronaldo made his first post-injury start in a 1–0 El Clásico defeat to Barcelona on 29 November. On 6 December, he was sent off for the first time in his Madrid career in Madrid’s 4–2 victory against Almería, a match which also saw him miss a penalty. He was carded first for removing his shirt during a goal celebration, then for kicking out at an opponent three minutes later. On 5 May 2010 Ronaldo scored his first Real Madrid hat-trick in an away game against Mallorca. Ronaldo and Gonzalo Higuaín scored 53 league goals during the course of the season and became Real’s highest scoring league duo in their history. With the departure of Raúl during the summer of 2010, Ronaldo was handed the No. 7 jersey for Real Madrid. On 23 October 2010, Ronaldo scored four goals against Racing de Santander, the most goals he has ever scored in a single match. This completed a goalscoring run of six consecutive matches (three in La Liga, one in the Champions League, and two for Portugal) in which Ronaldo scored in each match, totalling 11 goals, which is the most Ronaldo has scored in a single month. Before Real Madrid’s 5–0 defeat by Barcelona at the Camp Nou, Ronaldo scored his second La Liga hat-trick of the season in a 5–1 win over Athletic Bilbao. His final match of the calendar year saw him score a hat-trick in a 8–0 trashing of Levante in the Copa del Rey. Ronaldo began the 2011 with a very promising outlook, especially after Real Madrid acknowledged he had broken numerous goalscoring records, previously settled and held by classic players such as Alfredo Di Stéfano, Hugo Sánchez, and Manuel Alday. Ronaldo began his scoring spree by scoring two vital goals in a tight 3–2 victory away to Getafe. He then consolidated his massive performances by scoring a hat-trick and assisting Kaká to score his first league goal after his return from injury, in a 4–2 victory over Villarreal on 9 January. One game away from the middle of the season, Ronaldo had a very clear chance of breaking Telmo Zarra‘s and Hugo Sánchez‘s record of 38 League goals in a single season, since he was the league’s top scorer with 22 goals, above Lionel Messi. However, shortly after, Ronaldo experienced the biggest goal drought in his entire career, scoring only 2 goals in more than a month. During this period, Real Madrid acknowledged to have hit the crossbar more than 12 times in the season, most of the shots belonging to Ronaldo and almost all having happened during crucial moments in drawn matches. Ronaldo then made a massive comeback by scoring a hat-trick in a 7–0 trashing of Málaga on 3 March 2011, but was affected by a muscle injury at the end of the match, which forced him to spend 10 days on the sidelines. During the second league edition of El Clásico, Ronaldo scored from the penalty spot and took his tally to 41 goals, also taking his scoring streak to four games. On 20 April, Ronaldo scored the winning goal against Barcelona in the 103rd minute of the Copa del Rey final. This goal would later be chosen as both Ronaldo’s and Real Madrid’s best goal in the season by several fan polls, including those of Marca and Real Madrid’s website. 7 May saw Real travel to the Ramón Sánchez Pizjuán to take on Sevilla, where Ronaldo led the thrashing of a woeful Andalusian side, scoring four goals in a 6–2 victory. These four goals took him to 46 for the season which surpassed his previous record of 42 in a season playing for Manchester United. Three days later he reached 49 goals for the season, by scoring another hat-trick in a 4–0 home win against Getafe. On 15 May, after scoring two free-kick goals in a 3–1 win over Villarreal, he equalled the La Liga record with most goals in a season with 38, a record previously held by Telmo Zarra and Hugo Sánchez. On 21 May, he scored two goals in the last league match of the season against Almería, taking his Pichichi total to 41, and La Liga total to 40, becoming the first and only player to score 40 goals in a La Liga season. By doing this, he won the European Golden Shoe award once again, becoming the first player to win the trophy in two different leagues. The sports newspaper Marca, who awards the Pichichi Trophy, included the goal scored on 18 September 2010 to Real Sociedad in Ronaldo’s goal count, which officially attributed to Pepe. Should this goal be granted to Ronaldo, his goal count in the Pichichi Trophy would tally 41 goals. However, careless of this goal polemic, Ronaldo’s record-breaking figures became a source of major attention from public media, something that granted Ronaldo awards like Sports Illustrated XI, rating him as one of the world’s best footballers. Accounting for all competitions, Ronaldo ended the season with a total of 53 goals (not granting him the controversy goal from Pepe), having scored 25 goals with his right foot (excluding free-kicks and penalty-kicks) and 9 with his left foot. Real Madrid’s pre-season began with a 4–1 victory over MLS team Los Angeles Galaxy, with goals from Callejón, Joselu, Ronaldo, and Benzema. Four days later Ronaldo scored a second half hat-trick in a 3–0 win against Guadalajara. Ronaldo’s preseason performance was highly praised as world media kept hailing Ronaldo’s extreme competitiveness and motivation, even during friendly matches. On August 17, 2011, Ronaldo scored his 100th goal with Real Madrid with a first-half equalizer against Barcelona in the second leg of the 2011 Spanish Supercup in the Camp Nou. On August 27, 2011, he opened the 2011–12 La Liga season with a hat-trick in a 6–0 win at Real Zaragoza. In the first weeks of September, Ronaldo’s physical performance was subject to scrutiny by world media, after Castrol released a television film named “Ronaldo: Tested to the Limit” where he was put to test in several fields, including mental and physical. Conclusions from the movie and doctors on the weeks following claimed that Ronaldo was one of the best athletes in the world, excelling in football and outstanding in almost every other category. Several sources drew comparisons between him and other top athletes, including sprinter Usain Bolt. On September 24 Ronaldo scored a hat-trick (including two penalties) in Real Madrid’s 6–2 drubbing of Rayo Vallecano at the Santiago Bernabéu. This was his ninth La Liga hat-trick and tenth hat-trick for Real Madrid. On September 27 Ronaldo scored Real’s opening goal in a 3–0 defeat of Ajax in the Champions League. On 22 October, after not scoring in his previous three games, Ronaldo scored his tenth La Liga hat-trick and eleventh in total for Real Madrid in a match away to Málaga, which Real Madrid won 4–0. His twelfth Real Madrid hat-trick followed on 6 November, in a 7–1 victory over Osasuna that ensured Madrid stayed top of the table heading into the international break. On 19 November 2011, Ronaldo scored Real’s second goal in a 2–3 defeat of Valencia. On November 26, 2011, Ronaldo scored two penalties in a 4–1 defeat of Atlético Madrid in the El Derbi madrileño. On 3 December 2011, Ronaldo scored Madrid’s second goal in a 0–3 defeat of Sporting de Gijón in La Liga. He was one of the three finalists for the 2011 FIFA Ballon d’Or. On December 13, 2011, Ronaldo scored the second goal against SD Ponferradina in the first leg of the Copa del Rey Round 4, the match ended in a 0–2 win. On December 17, 2011, Ronaldo scored his twelfth La Liga hat-trick and thirteenth overall in a 6–2 win away to Sevilla. Ronaldo was third in the 2010–11 UEFA Best Player in Europe Award, behind Lionel Messi and Xavi Hernández, and second in the 2011 FIFA Ballon d’Or, behind Lionel Messi and ahead of Xavi Hernández. In Real Madrid’s next game in La Liga at home to Granada Ronaldo scored the fifth goal in a 5–1 win. He was notably criticized in the public media for not celebrating the goal. On 22 January Ronaldo scored two penalties in a 4–1 win over Athletic Bilbao, and on 28 January scored Real Madrid’s second and winning goal in a 3–1 win against Zaragoza. 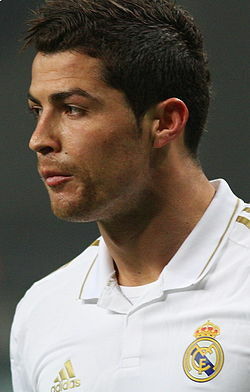 Ronaldo also scored two goals against Barcelona in the Copa del Rey Quarter-finals, which Real lost 4–3 on aggregrate. On 12 February 2012 Ronaldo scored a hat-trick, his thirteenth in La Liga and fourteenth for Real Madrid, in a 4–2 home win over Levante, including a beautiful long range effort. This win stretched Real Madrid’s lead over second-placed Barcelona to 10 points. Ronaldo was called up for Euro 2004, scoring in a 2–1 group stage loss to eventual champions Greece and in a 2–1 semi-final win over the Netherlands. He was named in the team of the tournament despite finishing with only two goals. He also represented Portugal at the 2004 Summer Olympics. During a quarter-final match against England on 1 July 2006, Ronaldo’s United teammate Wayne Rooney was sent off for stamping on Portugal defender Ricardo Carvalho. The English media speculated that Ronaldo had influenced referee Horacio Elizondo‘s decision by aggressively complaining, after which he was seen in replays winking at the Portuguese bench following Rooney’s dismissal. After the match, Ronaldo insisted that Rooney was a friend and that he was not pushing for Rooney to be sent off. On 4 July, Elizondo clarified that the red card was due to Rooney’s infraction and not the fracas between Rooney and Ronaldo that followed. Ronaldo was booed during Portugal’s semi-final defeat to France, and missed out on the competition’s Best Young Player award due to a negative e-mail campaign from England fans. Though the online vote only affected the nomination process, FIFA’s Technical Study Group awarded the honour to Germany‘s Lukas Podolski, citing Ronaldo’s behaviour as a factor in the decision. Ronaldo scored eight goals in Portugal’s UEFA Euro 2008 qualifying campaign, behind Poland’s Ebi Smolarek, but finished with only one goal in the tournament as Portugal were eliminated in the quarter-finals by Germany. When Carlos Queiroz was named Portugal’s new coach in July 2008, he appointed Ronaldo as team captain. On 15 June 2010, in Portugal’s opening World Cup match against Côte d’Ivoire, Ronaldo was tackled by right-back Guy Demel, which led to an argument and both being booked. The next day, Portugal contacted FIFA to suggest that Ronaldo’s yellow card be rescinded since he was “pulled into” the confrontation after having already moved away from the spot where he was tackled, but the appeal was rejected. Ronaldo failed to make an impact in the World Cup; after going scoreless in the qualifiers, his only goal came in Portugal’s 7–0 group stage thrashing of North Korea on 21 June, which marked his first international goal in 16 months. Portugal were ultimately eliminated by Spain in the Round of 16. Ronaldo during his spell at Real Madrid. Ronaldo’s father, José Dinis Aveiro, died of an alcoholism-related liver condition in September 2005 at age 52 when Ronaldo was 20. Ronaldo’s mother and Manchester United coach have stated that he does not drink alcohol as a result and he has received libel damages over a Daily Mirror article that reported him drinking heavily in a nightclub while recovering from an injury in July 2008. Ronaldo’s autobiography, titled Moments, was published in December 2007. Along with one of his sisters, Ronaldo opened a fashion boutique under the name “CR7” (his initials and shirt number). There are currently two CR7 shop locations, both of which are in Portugal; one in Lisbon and the other in Madeira. On 9 June 2010, Madame Tussauds London unveiled Ronaldo’s waxwork as part of the build-up to the World Cup. Ronaldo joined fellow footballers Steven Gerrard, Pelé and David Beckham at the event’s venue. In August 2010, Ronaldo reached 10 million fans on Facebook and in doing so made history by becoming the first non-American personality ever to achieve that kind of success on the social networking site. On December 5, 2011, Cristiano launched an iPhone game called Heads Up with Cristiano. The game is created by developer RockLive. Television footage of the 2004 Indian Ocean earthquake and tsunami showed an eight-year-old boy wearing a No.7 Portuguese football jersey who was stranded for 19 days after his family was killed. Following this, Ronaldo visited Aceh, Indonesia, to raise funds for rehabilitation and reconstruction. In support of the victims of the 2010 Madeira flood, Ronaldo played in a charity match in Madeira between the Primeira Liga club FC Porto and players from Madeiran based clubs Marítimo and Nacional. ← Can we stop Zairol Annuar Zailani from scoring more goals..
Pjg nar entry tok bro. Ckup lengkap suma pasal Ronaldo. Nang diehard fans la tok. Tp Euro 2012 klak Portugal dlm group of death. 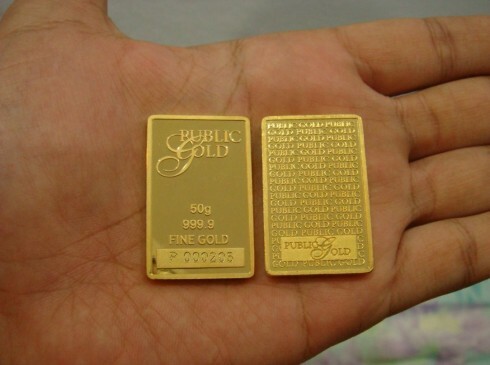 hehe..
posts, however this weblog offers feature based articles. simply because of the superior quality of the fabric used. popling shirts for both men and women.